« Church in Fundyland sponsors “International Burn a Quran Day”. Just faschistnating. Anne Rice is done with Christianity. “For those who care, and I understand if you don’t: Today I quit being a Christian. I’m out,” the bestselling author posted on her Facebook page. It’s not her faith in God, however, that she’s renouncing. It’s church organization. “My faith in Christ is central to my life. My conversion from a pessimistic atheist lost in a world I didn’t understand, to an optimistic believer in a universe created and sustained by a loving God is crucial to me. But following Christ does not mean following His followers. Christ is infinitely more important than Christianity and always will be, no matter what Christianity is, has been, or might become. Muslims are calling for the executions of homosexuals in America…This just shows you they themselves are upholding the laws that are even in the Bible of the Judeo-Christian God, but they seem to be more moral than even the American Christians do, because these people are livid about enforcing their laws. They know homosexuality is an abomination. If America won’t enforce the laws, God will raise up a foreign enemy to do just that. That is what you are seeing in America. With what we have been seeing in America recently – the Christian controversy about the governor’s race in South Carolina, the upcoming International Burn a Koran Day, the emotional rhetoric over the proposed Mosque at Ground Zero, the antics of Westboro Baptist Church and people like Ruben Israel all peppered by idiotic remarks from self-avowed Christians like Sarah Palin, Glenn Beck and Ann Coulter – I think that Rice is on to something here. My mother always told me that no matter how pure of heart you think you might be, you are judged by the company you keep. You are guilty by association. It’s ironic that so many of those who claim to be followers of Christ -Christians – are the types of self-righteous, intolerant and condemning religious people who Jesus tended not to associate with. So it looks as if Rice has decided to follow her conscience and that has her following Christ, something that few Christians seem to be doing. Good for her. I know that there are some very well-reasoned arguments for not doing what Ann Rice has just done. My old parish priest used to tell me when I’d be fed up with the latest Vatican absurdity: “Just because you didn’t vote for the President and don’t like the government doesn’t make you any less of an American.” And that’s true – we need to work for change from inside the organizations we cherish. There is a point, though, when this no longer works. Otherwise there would have been no Protestant Reformation nor an American Revolution. When an organization is so fractured, so disjointed and so contentious as today’s Church, then at what point will Christians finally have the vision (and the nerve) to stand up and say that the Empire has no spiritual clothes – that it is a sham, and a dangerous one at that. 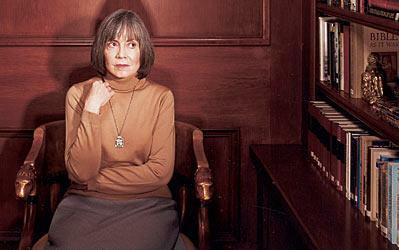 Only 12 years after her ‘re-conversion’ from atheism to Christianity, Anne Rice reached that point. I don’t think I have that much patience. How about you? This entry was posted on August 2, 2010, 11:57 am and is filed under Christianity, Culture, Current Events, Faith, Religion. You can follow any responses to this entry through RSS 2.0. You can leave a response, or trackback from your own site. It’s simply impossible for me to ‘belong’ to this quarrelsome, hostile, disputatious, and deservedly infamous group. sounds like any ‘group’ of people in general. I mean I get the sentiment and while I’m not pulling out of my local church, I don’t like calling myself a christian. I don’t know, the UCC (United Church of Christ) doesn’t seem to fit that description at all, yet they manage to call themselves christians. Yet they’re open and affirming, pacifistic, and pro-feminist. Maybe she’s just been hanging around with the wrong christians? I agree (though I would hate to determine who the ‘right’ Christians might be). But why is it that, for the sake of argument, the UCC has it ‘right’ while so many other denominations have it ‘wrong’? Are we part of the same story here? Are we reading the same script? Yes, that’s pretty much McLaren’s response as well. And though I agree with both of you, that no organization is exempt from these trials as they are imperfectly made up of imperfect people, I think that is an excuse that apologists for Christianity have overused. I mean, Jesus did seem to think that it was possible for us to live differently than how so many Christians have been living. So perhaps there is a flaw in the system so severe that it cannot be fixed. Or perhaps the system, the religion itself, is the flaw. There are some organizations out there, many of them Christian or of Christian origin, that don’t seem to cater some of the other nasty behavior and ideas that have come out of Christianity. They almost seem to be the exception to the rule. How is it that there is a such a diverse, even contradictory, opinion on what the Gospel is? Yes, it very well may be an ‘excuse’ to not have to dissect and change, its also a reality and it was just the first thought that came to me when I read the quote. I thought: “Wow, sounds like ‘life'” and if I was surrounded with that in my ‘christian’ travels, I’d pull out too! Thankfully I am NOT exposed to that on a personal intimate level. It may very well be that overall its ‘broked too much to fix’. 😉 Then again, it seems there have been ‘problems’ from the get-go and its inherent to society or humanity. Perhaps we can only be accountable for ourselves? Not an excuse to say its not my problem, I’m just thinking out loud again. Keep in mind, I don’t disagree with you or with Anne’s thoughts per se. Yeah, I’m serious. How is it that some people get “God hates fags and they’re only getting what’s coming to ’em” out of the Gospel while others hear a call to care for AIDS victims? Are we reading the same scriptures? And I really can’t accept the suggestion that, as a Christian, I should respect all the opinions and all the doctrines of all the people among all the denominations that call themselves Christian. That to be truly tolerant I must put my money where my mouth is and tolerate the intolerance of other Christians. That is just illogical. What’s that line? Unity in something etc. etc.? Sure. It matters little to me what the different Christian positions on baptism are, or confession, or the Eucharist, or the saints or miracles or speaking in tongues etc. There is a lot to be learned and appreciated among the diversity. But when those different traditions and dogmas are used to promote intolerance, hate, injustice….well I don’t think we believe in the same God or have the same understanding of who Jesus was and what he did. Essentially we do not belong to the same faith. So if that’s the case, who’s doing the posing here? More and more I’m beginning to see it Rice’s way. Besides I no longer believe in just about 90 % of the doctrines that most Christians say I MUST believe in order to call myself a Christian anyway, partly because it’s a slavish devotion to those doctrines that promote so much ugly Christian behavior. I’m not going to leave my “Christian” church – we read from the Gospels every week and are Christ focused, but not in the Tolkienesque way that so many others are. But we have atheists and Jews in our congregation who come every week for year after year and never ‘convert’. How is it that I identify more with them than so many Christians? Time to lose the labels. I don’t know how, but some people are doing it. I’d love to lose the labels. Truly Christian, I hate. I hate more than I care to admit. My hate just looks better than some of what you’ve pointed at and its quieter. Lately its really been bothering me. I don’t think one has to tolerate the intolerance. Not at all. Call it what it is. Its kind of ironic that Dobson’s son said something about it being ok to be intolerant because some things are just stupid. I would agree and I’d add to be intolerant because some things are just wrong. So we’re all going to be intolerant of some things. Or lots of things. Regardless of our doctrine. What sets us apart? Love? Selflessness? I think the message of Jesus has been usurped, forgotten, ignored, or just plain not recognized. I was reading on your blog and saw a quote about gospel being about sin management….same thing. Its all about sin!!! That is what the gospel is to very many people….its about sin and personal salvation (me, me, me) and then we can point at you, you, you because we’re primarily looking at sin, sin, sin. I didn’t read the article that you originally quoted from so I’m only going off the little that I read here. Yes, Kittimaqundi Community Church. Very little bureaucracy and practically no hierarchy. I find it to be both intellectually and spiritually fulfilling. The music could be ramped up a little bit though, unless you are crazy about the Wesley boys. What about you? Where you going? Still doing the Cohort thing? Hate. Yes. Me too, still. A lot less than I used to, though. I am not kidding when I tell you that I used to sound like Beck, Coulter and Limbaugh combined (though I don’t think Rush is on the same spittle spewing plane as the other two). I struggle with, and for the most part, am somewhat successful with trying not to hate those people I’ve been calling out. Maybe it’s because they remind me of me that they annoy me so. Or perhaps it’s because I remember being like some of them ( but not the Westboro boys, thank God) that I can forgive them. But not excuse them. And that bothers me even more, that so many fairly reasonable, intelligent and somewhat moderate Evangelicals won’t call these guys out on the carpet. Brothers in Christ and all that crap. Now that I think about it, that may be the best reason to remain an “official” Christian: you maintain a position of sanction – you can criticize the religion because you are part of it. Reminds me of how stupid the old Right Wing slogan was: “America – Love it or leave it”. The people criticizing America loved it just as much as the reactionaries – they hated what was happening to the country. But you rarely hear anyone telling someone to leave the church because they don’t agree with them. They may be called heretics or apostates, but the goal seems to be to change their minds so that they might be ‘saved’. Or maybe just stoned. The line about sin from the earlier post – I forget who made the observation but they weren’t in agreement with it. You are right – the obsession over ‘sin’ has muffled the gospel. Actually I was wrong. Shunning is still going on throughout many of the neo-evangelical congregations. I’m still at Chapelgate. 🙂 Its home. We got a new pastor some years back, he’s good to hear on Sundays. Sadly I’ve withdrawn from my local church a lot over the past few years. My dd has had some VERY serious issues. Still does, but I guess things are a little better. But its been isolating (by choice) and stressful. I don’t do any cohort stuff (emerging stuff??) I was always on the outskirts of that….not ‘in’ enough, too questioning. Never found a really safe space to think and question. “…or maybe just stoned” Yea. I think a lot of people who question find themselves on the outside. Maybe that makes people reluctant to stand up… ? I would love to see more people of faith openly dialogue about some of what I consider ‘fringe’ types (what Anne and maybe you see as more reprsentative I guess). That is one thing that I liked about the Emergent idea was that it was supposed to be a space of critical dialogue. It was on many levels and probably moreso when the conversation first began, but I think it deteriorated into a ‘closed’ group much like evangelical christianity. Cool. You make some good points about the whole emergent scene. I don’t see it with McLaren and a few others that I’ve read and even one or two that I know, but it sort of comes across as cliquish and (dare I say?) somewhat elitist. Not intentionally, but when the ideal vision of community is a Starbucks…. So maybe the problem with the ’emerging church’ is that they’re still trying to hang onto a version of ‘church’, albeit new and improved. Maybe ‘church’ is not where we need to be or what we should be striving for, even though it has become the buzz word of Christian faith for some time now. Maybe ‘church’ is what’s keeping us from engaging with the ‘un-churched’ and from being relevant in the lives of those who might be trying to encounter God. Maybe they/we would do better without church. What if Paul had never lived? Sorry, I don’t know what your “dd” means. oh sorry – ‘dd’ is ‘dear daughter’. One of those internet abbreviations I picked up years ago and forget not everyone uses it. I believe that may be something to think about. I often wonder about community gatherings rather than ‘churches’. But, I mean, I think ‘church’ serves a purpose for people of faith to come together, I think the problem is, that is how people sum up their faith. In totality – that’s it – church. A building and a place to go rather than a people and a way of life. Wow, wrote about this and Ms. Rice on my blog too. We are thinking too much alike. And you are right (as you said on your site) she always has been a bit bonkers. But maybe that helped with her writing. Gotta admit, I did read a fair amount of her early vampire stuff. Without Rice there wouldn’t be this huge vampire pop-culture thing we have now. Don’t know whether to praise her or curse her. You may have given up on the Catholic church, but we have not given up on you. Once a Catholic, always a Catholic. We will be here when you are ready to come home. Remember this reading from a few weeks ago…. 5 Some fell on rocky ground, where it had little soil. It sprang up at once because the soil was not deep, 6 and when the sun rose it was scorched, and it withered for lack of roots. Sounds like you’ve taken a lesson or two from the parable of the Prodigal Son or maybe the One Lost Sheep. But….in this case I think the roles are a bit different than you see them. To Rice, it is the Church that is lost. Once a Catholic…always a Catholic?! Where did that nonsense come from? religious title you place on yourself, you are not a part of the Kingdom of God. the Pope twice a day and take communion daily or cross yourself in front of an incon of the Virgin Mary. Unless you are born again, you are hell bound…no purgatory….hell bound. Why is this such a difficult concept to understand? Perhaps, Lafe, because it’s not true? That the idea of hell is as much a man-made construction as purgatory – steeped in Babylonian, Hellenistic and Norse mythology. Jesus (nor anyone else in the scriptures) ever uttered the word ‘hell’. I find it interesting that the Protestants, while vehemently protesting Roman Catholic traditions and dogmas, have so readily swallowed their doctrine of substitutionary atonement: an angry yet ‘just’ God who requires payment for our sins and violently sacrifices his sinless son (and consequently himself) in order to balance the books. And then punishes those who do not pledge allegiance to Jesus. Something both you and TAB probably agree on.